Preview images and cast list for the NCIS: Los Angeles episode "All Is Bright"
The team investigates a ransomware attack that takes out the entire power grid for west L.A. and paralyzes the city. Also, as the first holiday season since the death of Sam’s wife approaches, he struggles to find the best way for his family to celebrate, on NCIS: LOS ANGELES, Sunday, Dec. 17 (9:30-10:30 PM, ET/9:00-10:00 PM, PT) on the CBS Television Network. 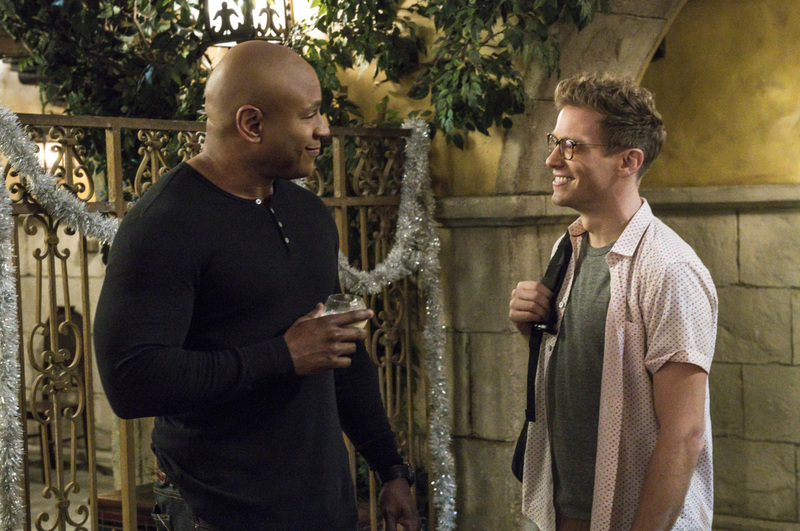 "All Is Bright" -- Pictured: LL COOL J (Special Agent Sam Hanna) and Barrett Foa (Tech Operator Eric Beale). The team investigates a ransomware attack that takes out the entire power grid for west L.A. and paralyzes the city. Also, as the first holiday season since the death of Sam's wife approaches, he struggles to find the best way for his family to celebrate, on NCIS: LOS ANGELES, Sunday, Dec. 17 (9:30-10:30 PM, ET/9:00-10:00 PM, PT) on the CBS Television Network. Photo: Monty Brinton/CBS ÃÂ©2017 CBS Broadcasting, Inc. All Rights Reserved. Andrea Bordeaux guest stars as NCIS Special Agent Harley Hidoko and additional guests include Alicia Fuentes (Lisandra Tena), Eli Bildner (Edgar Parsons), Uriah Shelton (Finn), Miriam Flynn (Marilyn Parsons), Bruce Beatty (George Forester), Jordan L. Jones (Brady), David Grant Wright (Oliver Decker), Alejandro Cardenas (Jose Fuentes), Marcus Terrell Smith (Larry), Fabian Jaime (Man), Steve Gutierrez (Robert Ruiz), and Santiago Veizaga (Child).